As most of you know by now, I’ve had a heck of a year. Not only has my body taken a beating, but my poor garden has as well. Just a few days ago I completed the last (knock on wood) of my 5 surgeries this year (FIVE!) and as usual it’s taken its toll on me. But the good thing is that since I’m not able to work in the garden for a few days (either my own or my clients) I finally have the time to write again. But even so, they were only able to do so much to manage the ebb and flow of a garden left to its own devices. It’s been nearly a year and a half since I went to New York for the summer and then returned home only to be immediately diagnosed with breast cancer. So yeah – my garden has had to hold its own for awhile. That’s me, sitting in the middle of the almost-dry Truckee River. Sad, isn’t it? And as if that wasn’t enough, my garden had to contend with yet another year of drought. Terrible drought. The worst drought in hundreds of years. What next – the plague? During the summer, I’d anxiously await for our monthly water bill to see if we were above or below our allotted amount. One month we were up quite a bit, but that was due to a giant leak hidden in our hedge. After we fixed it, however, we’ve been really close to our designated amount – hooray! 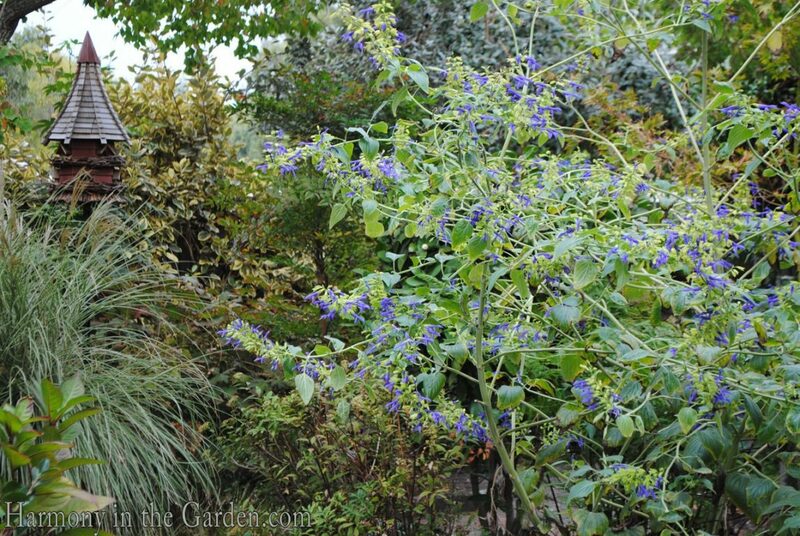 This my blue and yellow garden bed, echoing these two colors with foliage in shades of yellows, golds and blues. 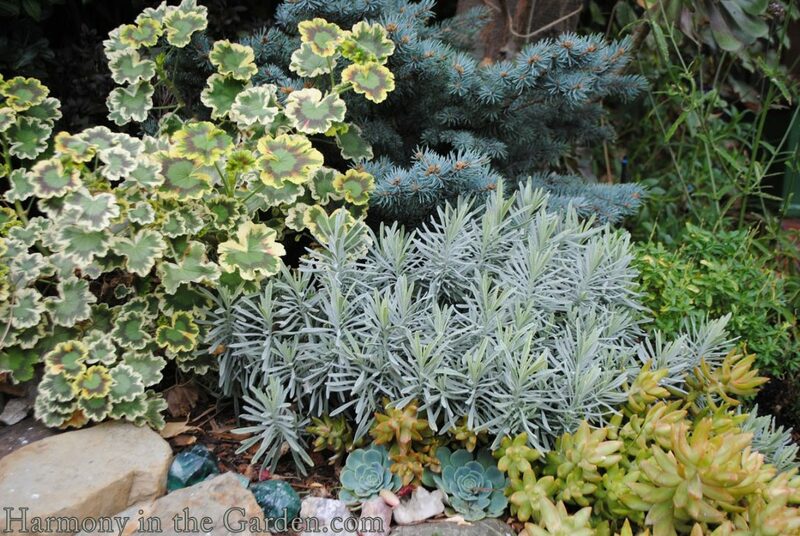 The centerpiece is my Octopus Agave who lives in the urn (agave vilmoriniana ‘Stained Glass’), with nearby abelia ‘Kaleidescope’, succulents (sedum nussbaumerianum, echeveria imbricata), pelargonium, lavender ‘Platinum Blonde’ and a blue spruce ‘Globosa’. This combination looks great year-round and because of that, it can’t be beat. It took me nearly 30 minutes of lurking in the bushes to capture this elusive and oh-so-wary Anna’s hummingbird – but I finally did it. 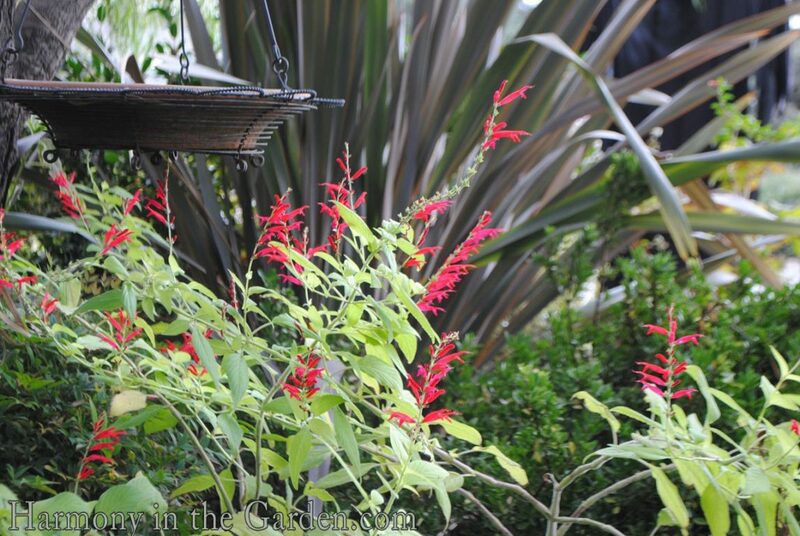 He adores this salvia ‘Mexican Limelight’ that I ordered from Annie’s Annuals last winter almost as much as I do. Towering over 8-feet tall, this is a hummingbird’s fantasy. What is it about lantanas that make me love them so much? The 4×4 ‘Irene’ and tiny 2×2 ‘Silver Mound’ are two of my favorites as they keep on blooming no matter how hot it becomes. While it’s true they look pretty awful in the winter, they’re definitely worth it as they’re the ultimate low-water beauties. The leucadendron ‘Safari Sunset’ comes into its own mid-summer, lasting well into the winter with beautiful shades of red. At its feet are the little orange wands of bulbine ‘Hallmark Orange’. The combination of the two guarantee color from June thru December. Just be careful when watering the leucadendron, as it’s one of those plants that means it when it says ‘drought tolerant’. Its easy to love this one to death with too much water. I know I write often about my grevillea ‘Superb’, but how can I resist when it’s always in bloom? While the Anna’s hummingbird is busy guarding the ‘Mexican Limelight’ in the back, there’s another one guarding this grevillea. 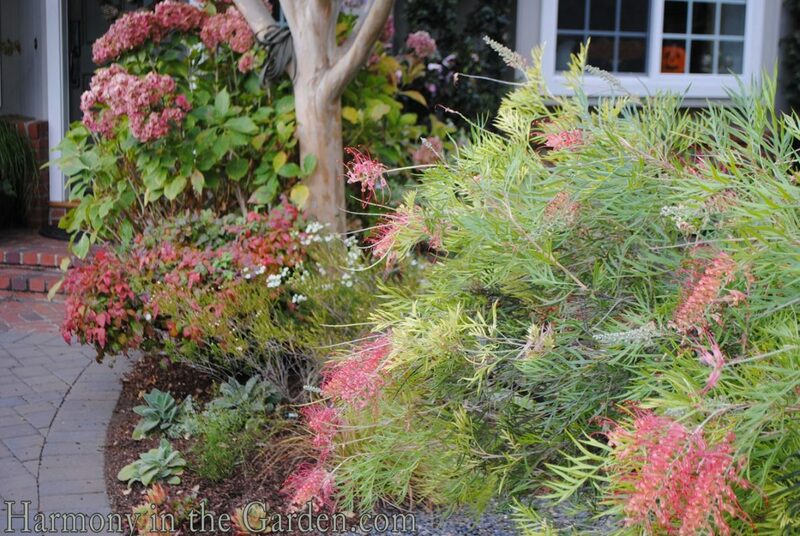 I adore the fall color echoes of the flowers with the changing colors of the hydrangea and the nandina ‘Fire Power’. 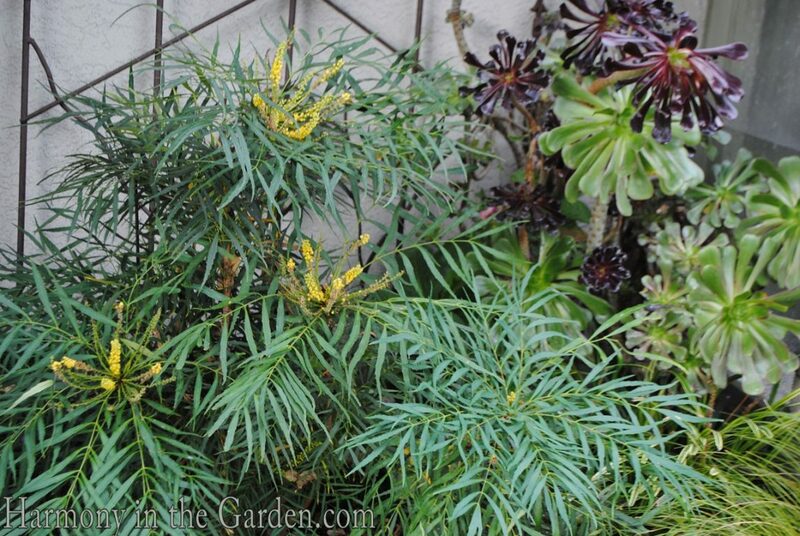 This mahonia ‘Soft Caress’, from Sunset’s Plant Collection, is one of my favorites for shady garden beds. 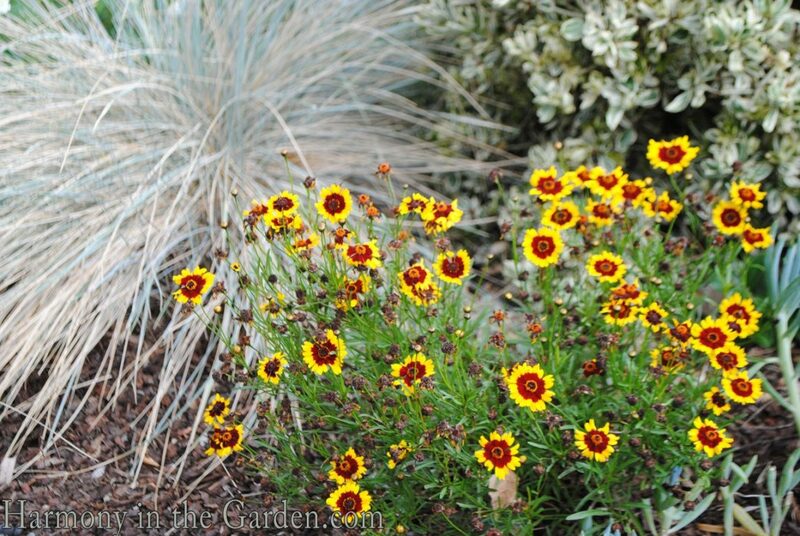 Growing to 3×3 it begins sending out fingers of yellow flowers in early fall, lasting well into November. And here’s more good news – I’ve heard from one of Sunset’s plant gurus that this mahonia is also happy growing in a fair amount of sun, too. I plant these a lot in my clients gardens and while they’re deer resistant, alas they’re candy to bunnies. While I’ve planted a lot of loropetalum hybrids over the years, nothing beats the classic ‘Razzleberry’ for hardiness and longevity. 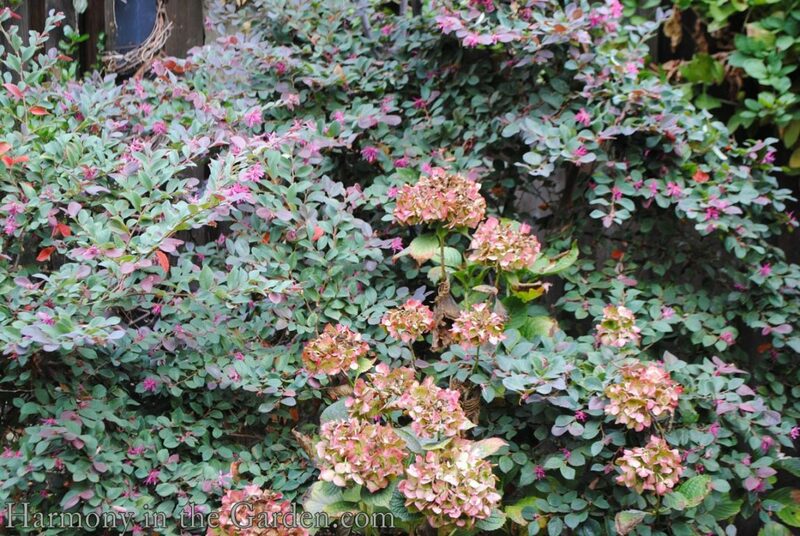 I thought the hydrangea ‘Glowing Embers’ wouldn’t survive the drought on its limited watering schedule, but here it is, happily peeking out from under the loropetalum’s skirts. Another late bloomer is the super-tough Pineapple Sage (salvia elegans.) 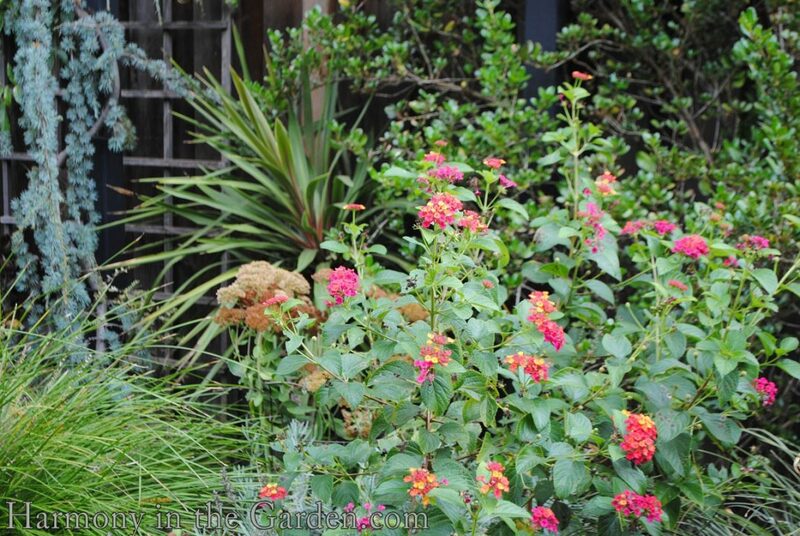 The chartreuse foliage and eye-popping red flowers are stunning when backed by the phormium’s dark foliage. 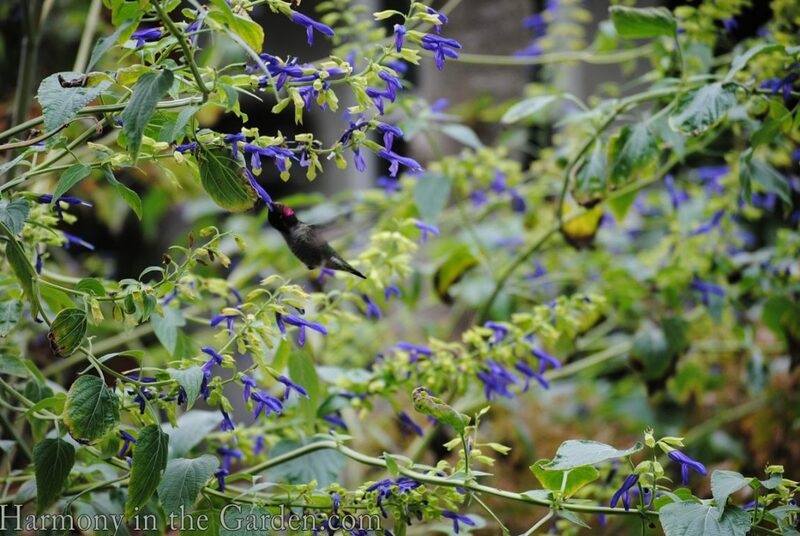 I’ve planted this salvia for decades as it’s one of my daughter’s favorites to nibble as she wanders the garden. Now she’s passed this tradition on to my niece who also looks forward to tasty treat when she comes to visit. This is the cutest little coreopsis (c. ‘Coloropsis Salsa’) I’ve had in awhile, putting forth wave after wave of flowers throughout the summer. Unlike many hybrids that seem to be more delicate than they should be, this one has bloomed non-stop in partial sun with very little water. Fingers crossed it returns next year! 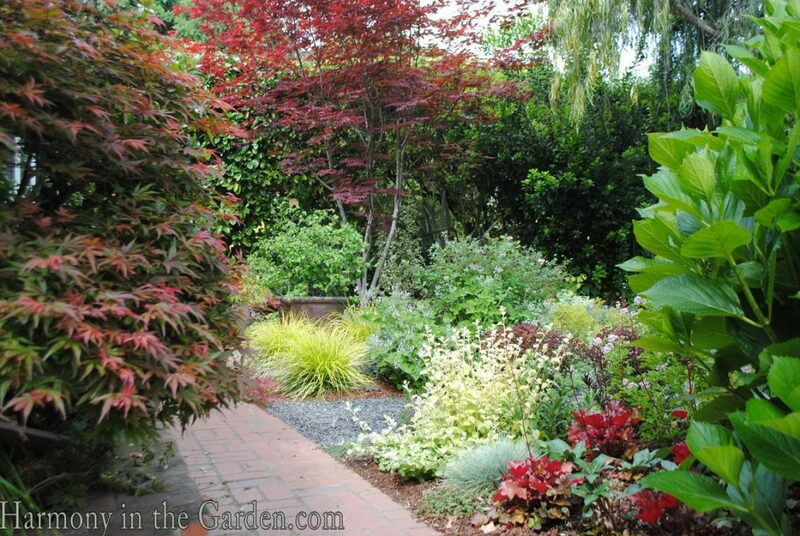 You’ll notice there aren’t many flowers blooming in this combination, yet the burgundy foliage from the ‘Shaina’ and ‘Bloodgood’ Japanese maples and the chartreuse blades of carex ‘Everillo’ provide plenty of pizzazz. And because these maples have been growing in my garden for several years, they survived the drought with just a little leaf-tip burn. 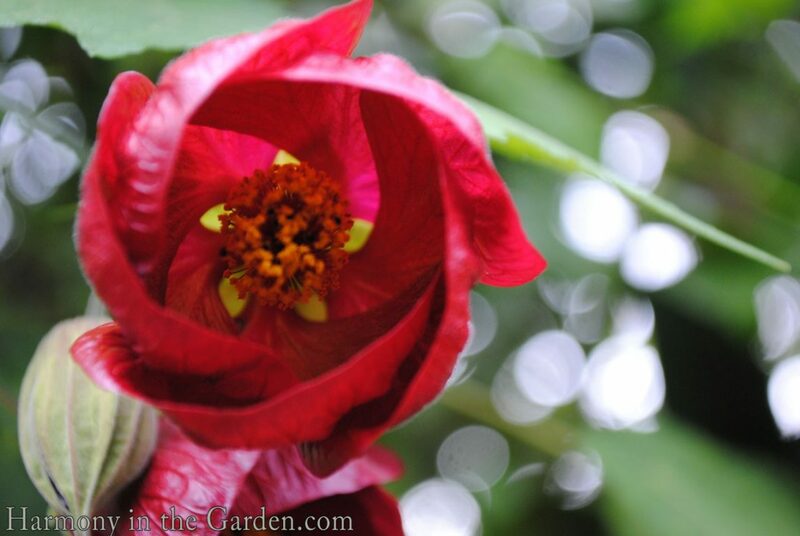 One of my very favorite abutilons is ‘Nabob’, winding up and through my ‘Sally Holmes’ rose. Blooming for months and months at a time, each over-sized flower nods downward making it ideal for gazing up into their stained-glass centers. 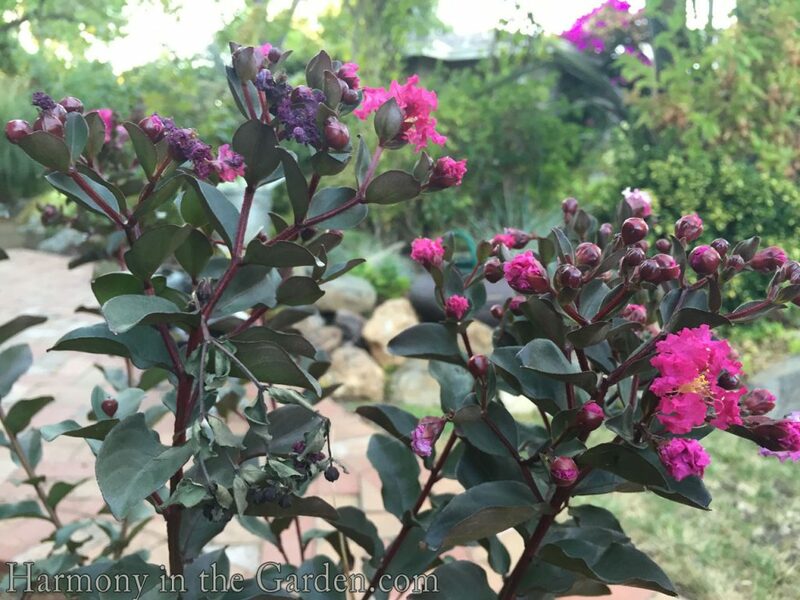 A new addition to my garden this year is the ‘Mystic Magenta’ crape myrtle, sent to me by Black Diamond Blooms. Just look at the burgundy foliage, which hasn’t faded one bit in the 5 months that I’ve had this plant. 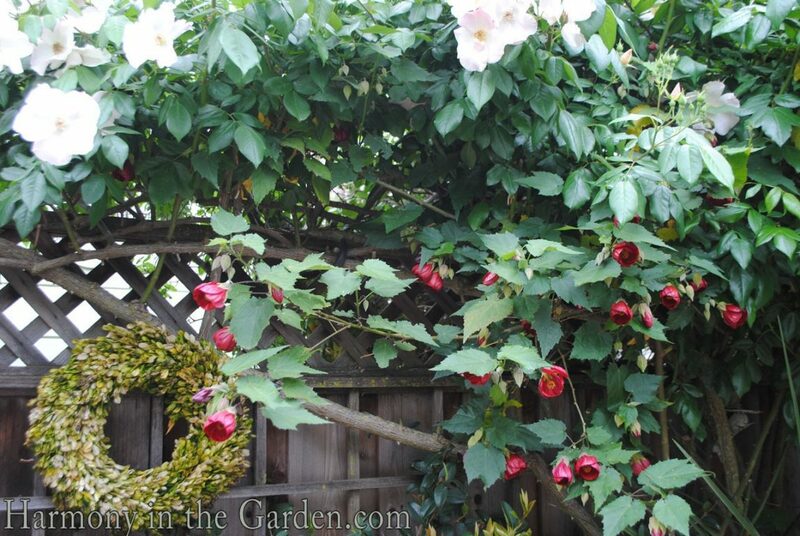 It’s a smaller tree, growing to 12’x 8′, making it perfect for small gardens. It’s been happily growing in a pot until I can find the perfect spot to plant it. 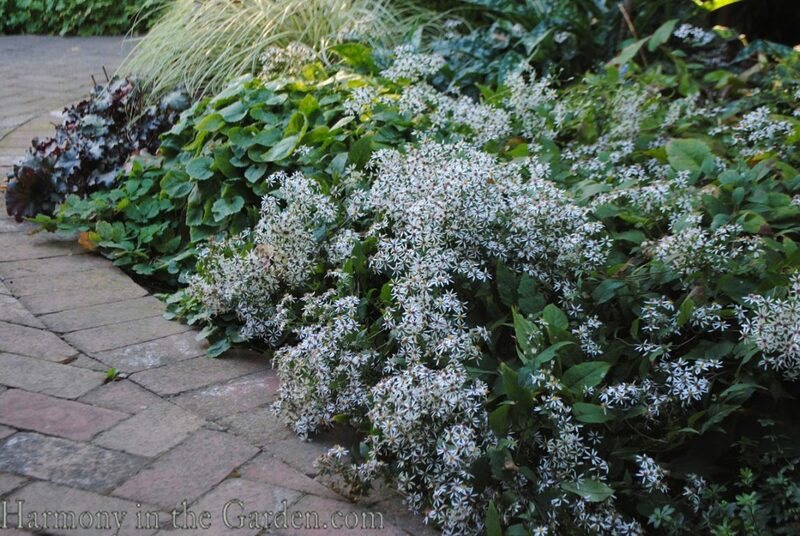 The little starry white flowers of the Wood Aster are like a foamy wave, crashing over the edge of this raised bed. They’re tiny and too many to count, but the sheer number of them makes quite an impact when viewed from a distance. 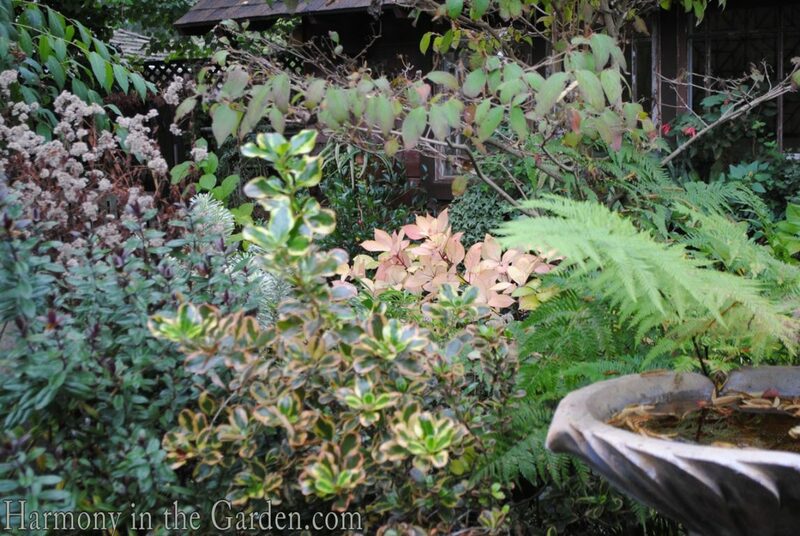 Soon the foliage will begin to turn yellow, adding another pop of excitement to my ever-changing garden. 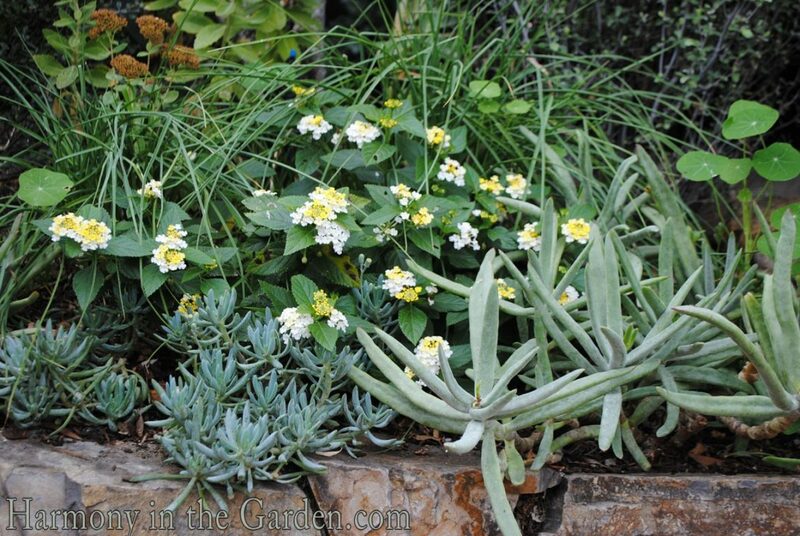 While you always hope your low-maintenance, drought-tolerant garden will be exactly that, to see it actually walk the walk is pretty awesome. 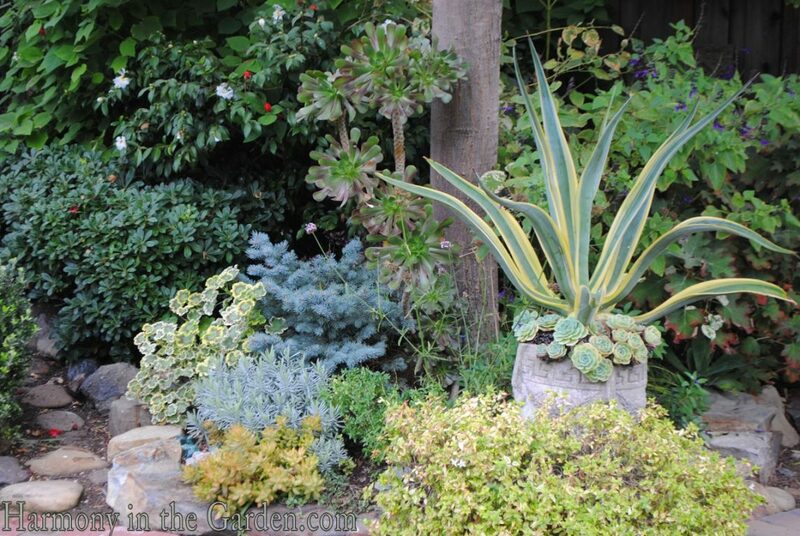 Reduced water bills, low-maintenance plants that have thrived despite zero coddling from me, drought-tolerant plants that really are drought-tolerant – I’m happy to say that both my garden and my body have officially beaten cancer! 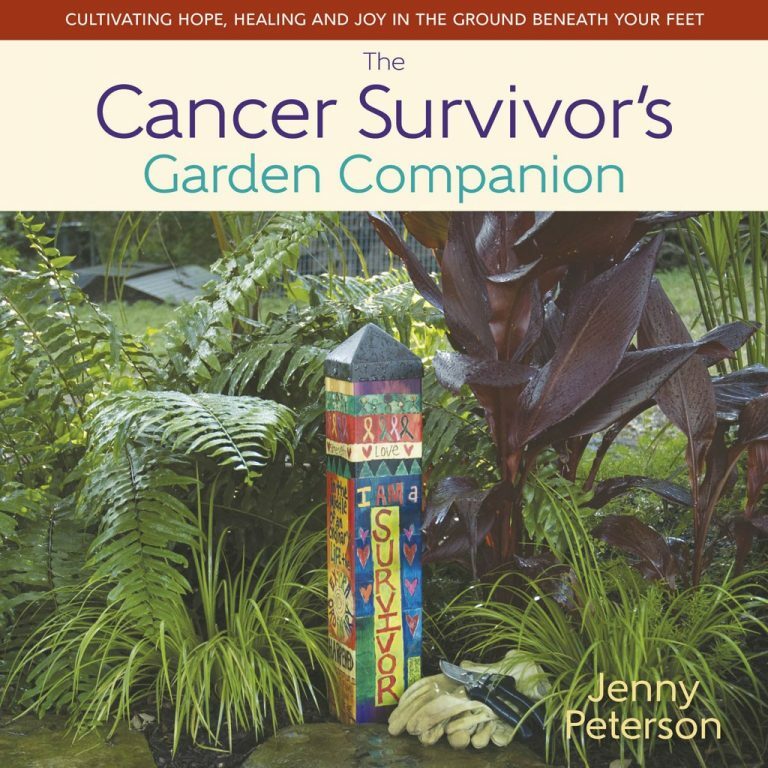 In a very related side-note, I’m thrilled to announce my good friend Jenny Peterson’s new book The Cancer Survivor’s Garden Companion that will be available this coming January. I’ve known Jenny for years, and as she had breast cancer a few years before I was diagnosed, she was the first person I called when I found out that I, too, am a member of this club. For a few more days (until the end of October), you can pre-order her book through our friend’s link above with 20% of Jenny’s proceeds along with all affiliate proceeds to be donated to fund metastatic breast cancer research. Thank you, Jenny! From the Bay Area here. Your garden is absolutely beautiful. I hope you have a full recovery, and a holiday time full of lots of people supporting you and lots of fun. Thank you, Lisa – I appreciate your positive thoughts coming my way! Although your winter El Nino feast of rain (I hope) will be our east coast Australia ‘famine’ drought through our approaching summer, I feel like it’s our turn again. Our Millennium Drought 2000-2009 was a nightmare and so many people just gave up gardening for good. 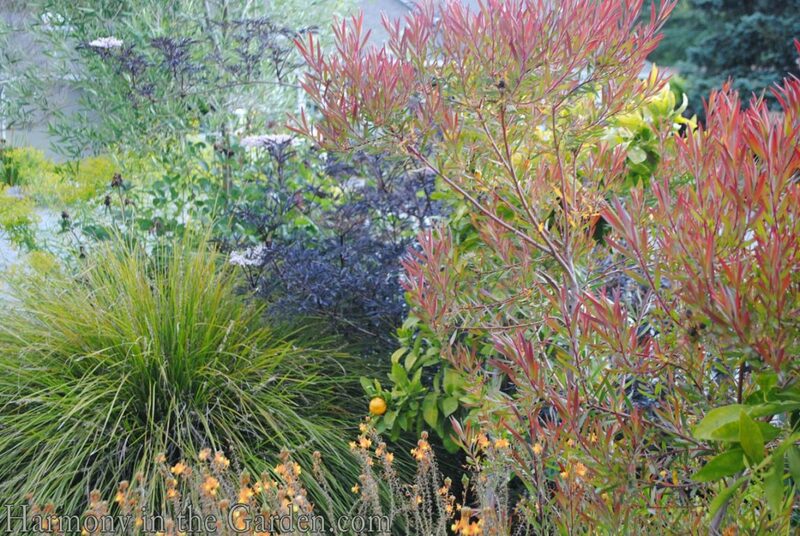 It’s very interesting to see the planting combinations that have been winners for you – both through drought and your ill health – and how fresh and pretty they look even though they are not all flower-filled. I wish I had your unerring eye for colour and texture grouping. I think it’s time I re-read your book…and I’ll look forward to finding Jenny’s in Oz too, I hope. It is so wonderful to see new color all the time, your good preparation paid off. Your pictures are so great, and I remember most of the places photographed. Thank you for sharing. Love and Hugs. Jean. Looking forward to trying some of the plants you mention in your article. 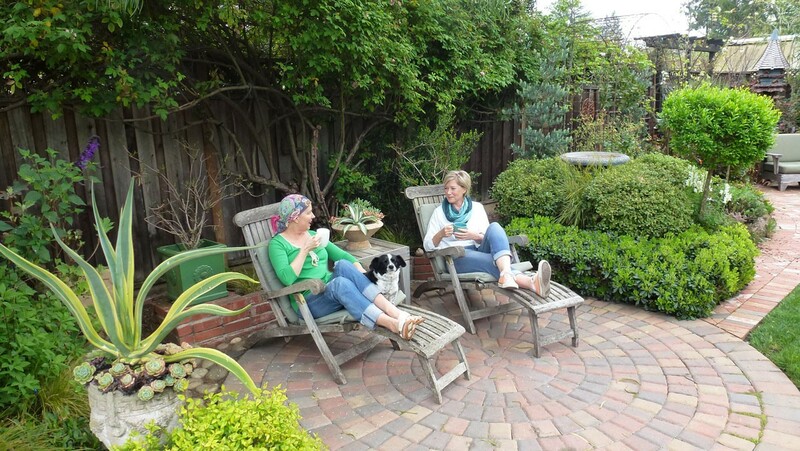 It’s been about 18 months since we ripped out our lawn and re-did our backyard – we love it! Thanks for all your advice on the project. When you’re feeling up to it I’d love to have you come over to take a look. Thanks for sharing the story of your illness and the peace you find in your garden. Take care. I was JUST thinking about you, Dale, as I walked my dog by your home the other day. I’m so glad to hear you’re enjoying your garden and would love to see it. And thank YOU, Robin, for your generous donation to this most worthy cause. Dearest Rebecca, you and your garden are inspiration to us all. Gardens are havens and sources of solace and strength. And yours is so dang beautiful! I doubt you remember, but you and I “met” about two years ago when you were looking for late winter scented plants and I chimed in with my love for Edgeworthia. I was living in Virginia then but have moved to Saratoga since. Your garden is a source of very pertinent inspiration for me now! This winter I am putting in plants and am studying your list of favorites very seriously. The fact that your garden looks this good after not being tended as closely as it’s used to is a testament to how well you’ve prepared it, Rebecca! 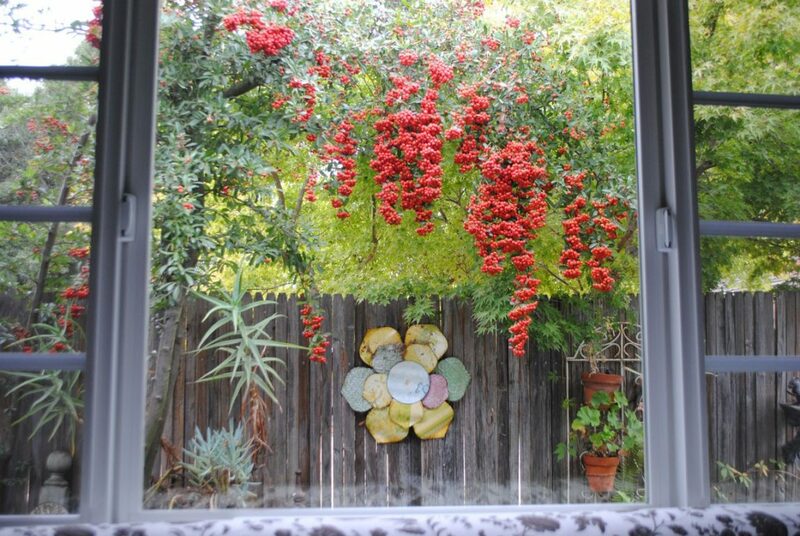 I’ve always loved your garden — it seems like such a haven, and I’m thankful you’ve had it during this tough year. Thanks so much for talking up my book — it’s out during the first week of January 2016, and I am hopeful that through it, other cancer survivors can find refuge in their gardens just as you and I have in ours. Big love to you! Great article Rebecca! Great photos! Yes we are all learning what plants are really drought tolerant in our own gardens. I am praying for a normal wet winter at the least! Take care, great to hear from you! Thanks, Sabrina. Yes, let’s pray for a wet, wet winter so our gardens can catch a break!